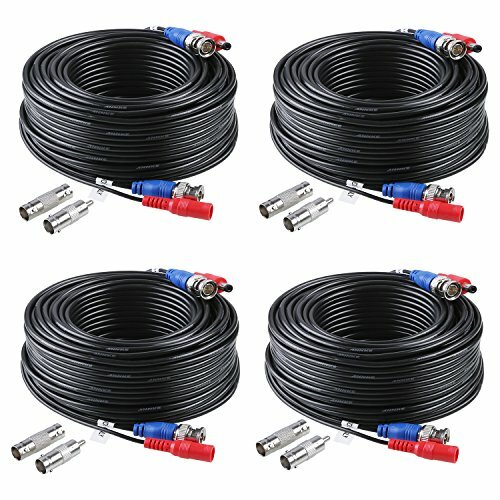 * Make an easy connection between your surveillance cameras to your power supply and digital video recorder (DVR) with this video/power cable. * It comes with pre-made 2.1mm power plugs and BNC video connections for use with our security cameras/DVRs or any standard Surveillance equipment. * Use with Closed Circuit Television (CCTV) applications and security camera components. * This pre-terminated CCTV cable is perfect for transmitting video and power. * Simplify the installation of surveillance systems by using one cable to transmit video and power. * Extend the cable on your camera easily with this extension kit. * Do not waste time soldering or crimping together your own cables or voiding the warranty by splicing in your own wires. * All-in-one video and power cable in black color Plug and Play ready. Most cameras only have a few feet of cable coming off the camera. This cable will help you to extend the power and video signals. Now, it's easier than ever to mount your camera just about anywhere you would like. This cable is well adaptive to various application scenarios like the surface and inside of walls, floors, etc. If you have any questions about this product by ANNKE, contact us by completing and submitting the form below. If you are looking for a specif part number, please include it with your message.